No, Triumph did not make a fabulous chrome emblem for its Gloria bicycles. 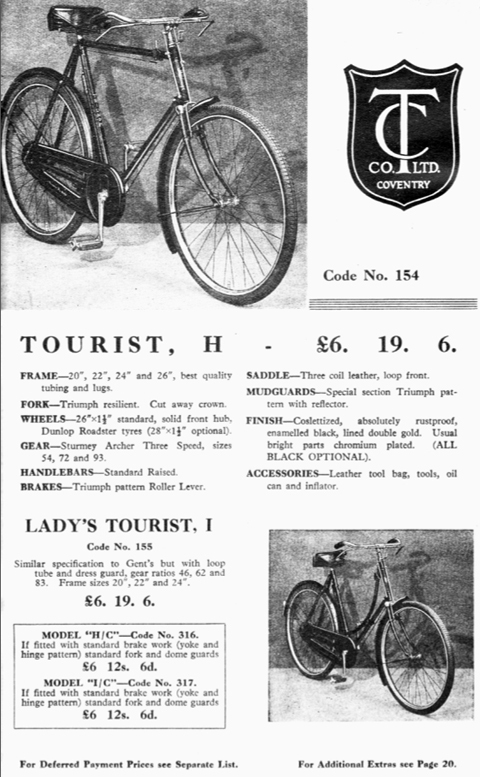 The mascot is for the Triumph Gloria range of sporting saloon cars that Triumph introduced in 1933 …after discontinuing their Gloria Cycle range soon after this particular machine was built. …but as this original Triumph-Gloria Roadster is the only known survivor, I fitted a winged goddess emblem to the front mudguard anyway. All Triumph bicycles are rare and sought-after. It’s not surprising when you consider that the company was Great Britain’s primary motorcycle manuafacturer: vintage motorcycle collectors compete with bicycle enthusiasts to find vintage Triumphs of every type. 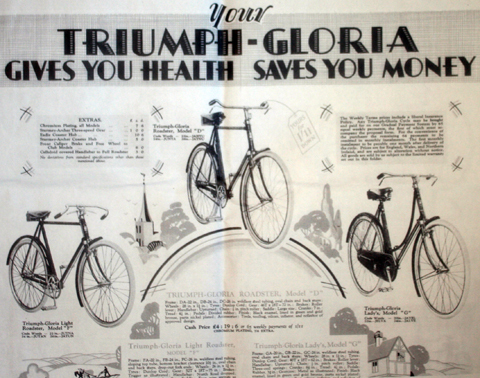 Vintage car collectors also prize Triumph Gloria bicycles as they are even rarer than the fabulous 1930s Triumph Gloria Sports Saloons. 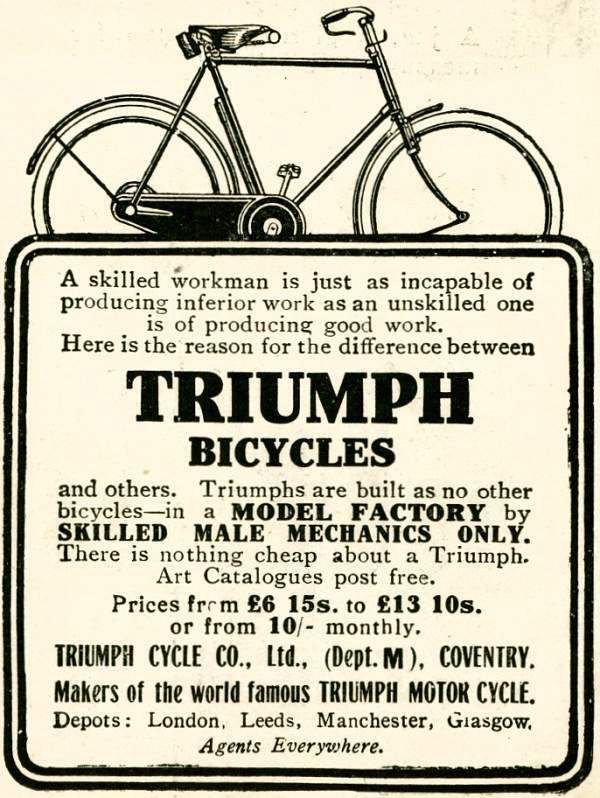 Due to feedback from their cycle agents, Triumph tried making cheaper machines: they made a ‘Standard’ model in 1905. But, of course, everything made in the same factory went through the same expensive processes and quality control; so selling cheaper machines just made their top-of-the-range products look overpriced. 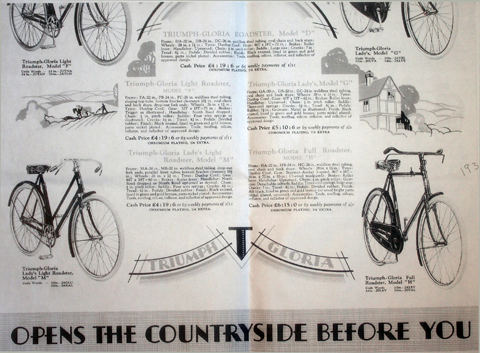 Using a different factory, and made with different fittings, Triumph’s Gloria Cycle Co was the therefore the solution to selling bicycles that were cheaper than Triumph Cycle Co‘s own products, but still took advantage of their top reputation, distribution network and agencies worldwide. Early Triumphs are large machines, and this 26″ frame Beast is no exception. 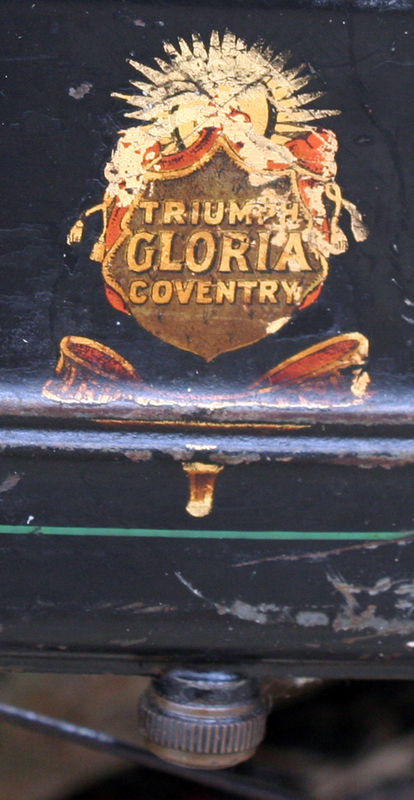 The paintwork is original and very well-preserved, with its original transfer (decal) on the headstock (faded but readable), as well as on Triumph’s patent oil-bath chaincase (above and below). Anyone who has experienced the luxury of a Rolls Royce understands why it is more expensive than an Austin Seven. The build quality and attention to detail mean that not only does the vehicle last longer and require less attention, but it is also an ultimate driving experience. 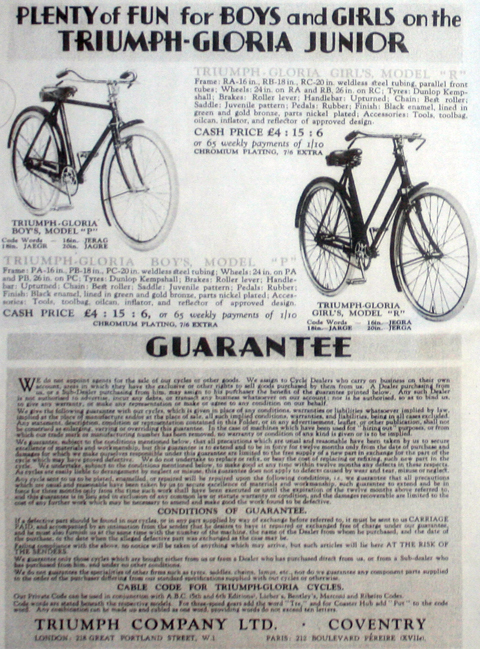 Likewise the output from Great Britain’s top cycle manufacturers. 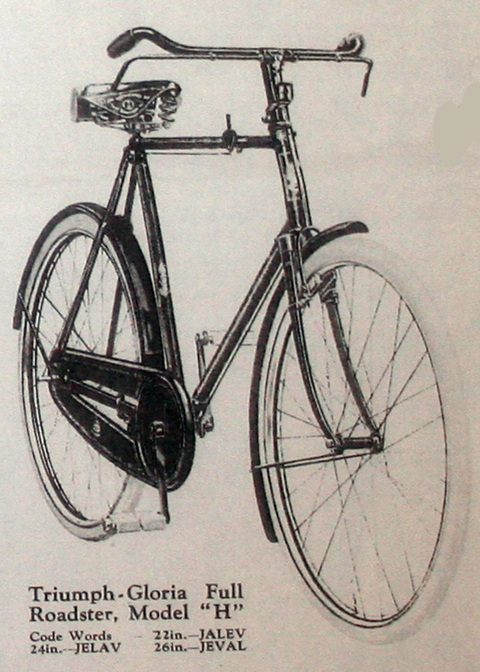 Sunbeam, Lea Francis, Centaur, Beeston Humber and Triumph were the world’s most expensive bicycles in their day for a very simple reason …they were built to last and they ride so well. Having become a separate class of ‘classic’ – reflecting the similar distinction of top car and motorcycle marques – they were a good investment when they were new, and they still are today. This example is very original, with excellent unrestored paintwork. The only things I’ve replaced are the tyres and inner tubes …and the Gloria Winged Goddess emblem on the mudguard. Mechanical restoration was not needed, but this Triumph-Gloria Full Roadster has been serviced and is ready to ride. Photographing these two contemporaries at Black Rock Station, I was amazed to see how the British Triumph was head and shoulders above its American cousin. Although the American manufacturers’ ‘motorbike’ style was criticised in the British press, the swept-back handlebar set with crossbar and the ‘motorbike’ tank – which opens to provide a tool-case – are superb features. Nevertheless, it rides terribly! It was only made for a teenager to ride around town; whereas British bikes were commuter machines ridden by adults. The Gloria is well-built and, despite its heavy weight (25kg), with its Sturmey Archer three-speed gears it’s a fast machine. When I saw this bike it was love at first sight. Unrequited love is love that is not openly reciprocated or understood as such, even though reciprocation is usually deeply desired. The beloved may or may not be aware of the admirer’s deep affections. And how suspect is it to admit loving a Man’s bike named Gloria? How on earth can I talk myself out of this pickle? A skilled workman is just as incapable of producing inferior work as an unskilled one of producing good work. Here is the reason for the difference between Triumph bicycles and others. 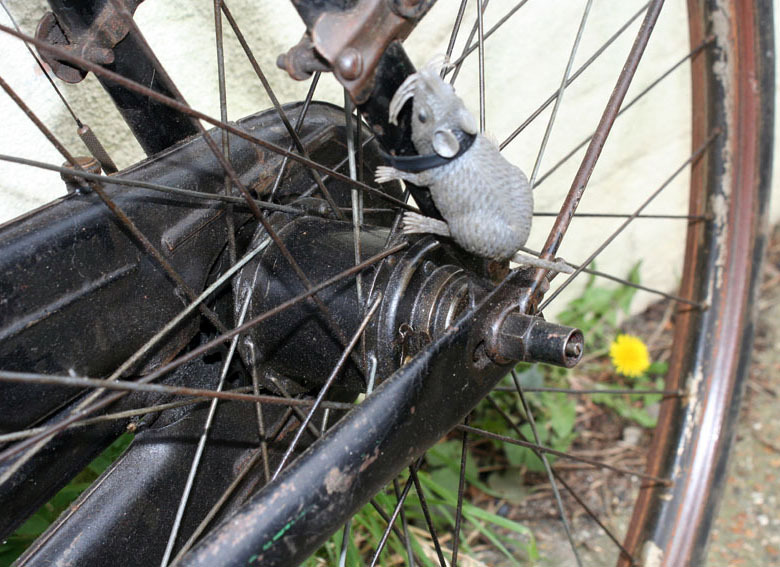 Triumphs are built as no other bicycles – in a MODEL FACTORY by SKILLED MALE MECHANICS ONLY. There is nothing cheap about a Triumph. Triumph did not trust women in their factory! As you can see from the pictures, this Gloria is a glorious machine, in original unrestored condition, with the patina one might expect from over eighty years of existence. This Roadster boasts a full complement of accessories: dynamo, lights, bell, rear carrier, reflector, bag, inflator pump, as well as the piece de resistance …a 1931 penny. After Gloria Cycles ended – the name being needed to adorn the latest Triumph Gloria automobile range – the ‘Model H Roadster’ style was continued as part of the Triumph model range. 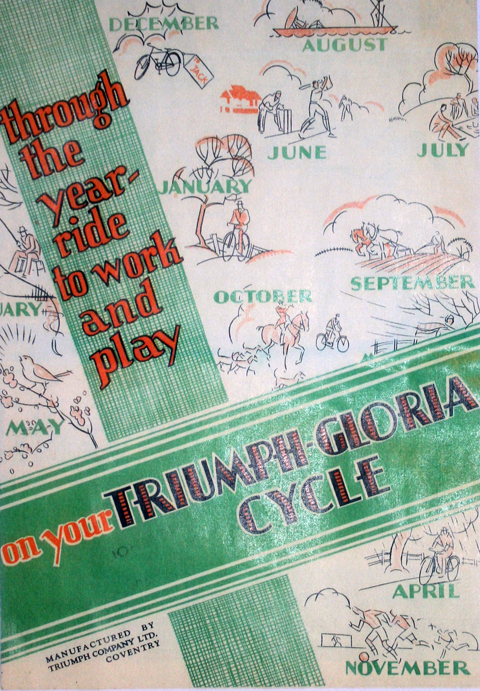 Triumph’s cycle business was sold in 1936, and their machines were no longer exclusive. 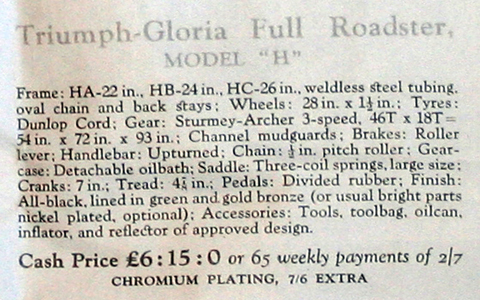 Compare this 1931 Gloria with the more chepaly-produced 1939 Triumph Model H Tourist illustrated below. During WW2, Triumph’s Coventry factory was destroyed by German bombs. 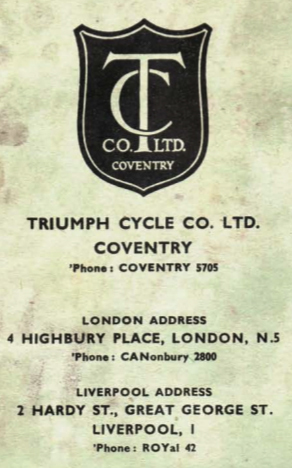 After the war, trading as Triumph Cycle Co Ltd, the company mainly produced lightweight sports bikes. In common with the rest of British industry postwar, the majority were exported to the USA to help repay the massive American war debts. BSA took over Triumph Cycle Co Ltd in 1951, and BSA’s cycle division was itself taken over by Raleigh in 1956. 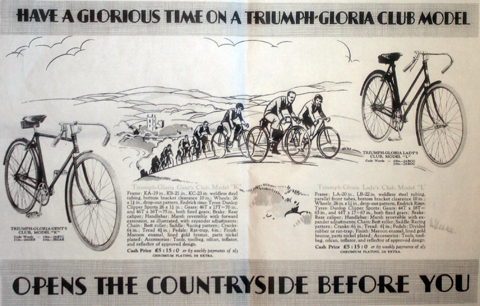 At various times, to help the company concentrate on more important parts of their business, Triumph bicycles had been made by other companies, a practice common throughout the bicycle industry from the start. Triumph was really a German company, but its British bicycle, motorcycle and car production turned it into one of the top classic British marques. 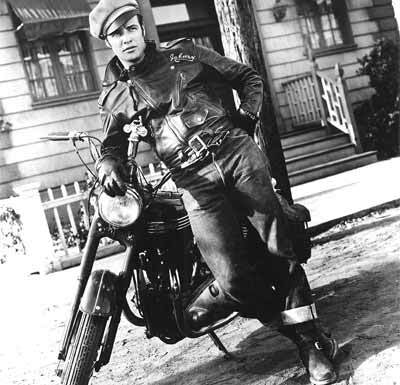 Additionally, with Marlon Brando astride one, Triumph achieved iconic delinquent status. Cyclists may not be quite as errant as the ‘wild one’ but, in my mind, whether sporting Triumph badges or the inverted levers of pre-WW1 Triumph cycles, any early vintage machine bearing the Triumph name represents a nostalgic reminder of Great Britain’s history as an industrial world superpower.